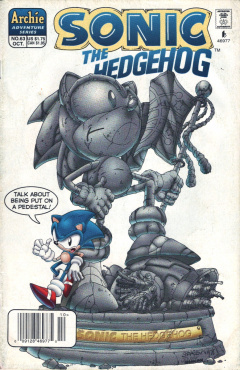 Sonic the Hedgehog 63 is the sixty-third issue of the Sonic the Hedgehog comic. This issue features two stories. The lead story is entitled "Icon II - Cult Of Personality", while the secondary story is titled "Tales Of The Freedom Fighters - On His Majesty's Secret Service - Part III"
At the prison known as the Devil's Island Gulag, anarchy reigns! The prisoners have somehow managed to escape, and are putting a good hurt on all the guards! Snively watches, frozen in horror at the carnage. He was planning to break out, but had no idea that it would happen so soon! "Never leaving Sand Blast City." Jack interjects. "Not today. Not tomorrow. Never. He is going to be a part of this town for the rest of his natural born days!" Night time back at Sand Blast City, when Tails receives a rude awakening from his best friend. It turns out that Sonic wasn't fooled at all by the Sand Blasters' hospitality. He just didn't want to let on that he was on to them, adding that if they'd fed him one more chili dog, he'd have to trademark a new favorite snack. They're busting out in the dead of night, but before they're even able to take two steps outside their suite, Jack Rabbit confronts them. Sonic and Tails make a break for it, with Jack's subordinates giving chase. The heroic duo need to find the force field controls to break out, and quick! Tails is tasked with starting the bi-plane, while Sonic will look for the force field controls. He searches and searches, beating up goons on his quest. His search is fruitless until suddenly it hits him: The force field is the most important thing in the city... It would only make sense to put the controls in the most important spot in town. He knows he's going to hate himself for what he must do next, but it has to be done! He goes into a triple spin, full force into the very statue erected in his honor. It flies apart, smashed irreparably. The force field fails, and the Robians biding their time just outside attack. Jack swears that Sonic will pay, but Sonic rushes off, unconcerned about Jack's ultimatum. With Tails flying the plane overhead Sonic leaps, Tails catches, and they both make a clean getaway, as Sand Blast City smolders behind them. Princess Sally Acorn is not happy. Geoffrey St. John has been absent every time she's needed him. She goes to confront him directly, but his lieutenant tells her that he's not around. The Princess wants him to step aside, for she would like to confirm this herself. The lieutenant shrugs and tells her she's not authorized. Sally is shocked. Since when has she ever been "Unauthorized" access to anything? The lieutenant tells her to take it up with Geoffrey, wherever he is. Elsewhere in Mobotropolis, Geoffrey and his newly-assembled team are in the midst of an obstacle course. The robot known as Heavy taps into a doorway, granting access. Another robot requests Heavy stat his business. Heavy responds by claiming that he has important information for Dr. Robotnik. He's granted access, and the team infiltrates the building's innards. Valdez disables the sensors, doubting they were up to spec in the first place. They infiltrate further. A swatbot is on patrol down a hallway. Valdez smashes it from behind, thinking this is too easy. Hershey points out that they have to return it to base to complete the mission. Not so easy. Valdez suggests unscrewing the head and taking it in parts, but Geoffrey shoots the idea down, saying it's "Everything or nothing". Hershey finds a cart, and they plop it on and roll it outside. Once outside, St. John discovers Princess Sally waiting for him. She wants him to start explaining. He can't do that. She orders him. He can't obey, for he gets his orders from her superior, King Acorn. He tells her that she'll have to take it up with him. And she shall. Geoffrey and his team continue on their way, still carting the dead swatbot as Geoffrey tells them they'll receive their final grade today. This page was last edited on 28 March 2019, at 17:44.